Phoenix Reborn slot (Play'n GO): expert slot review & find casinos to play. The Phoenix Reborn video slot is far from the first Play’n GO slot that we are reviewing this year (2019). After the Cash Vandal, Golden Colts, Rise of Dead, Starblast and Contact video slot it is time to review the Phoenix Reborn slot. Just like the Contact slot of Play’n GO, this slot also has an Aztec theme. When reviewing the Contact slot, we have already indicated that this theme has been somewhat milked out. A further introduction seems unnecessary to us. So let’s move on quickly with our video slot review. 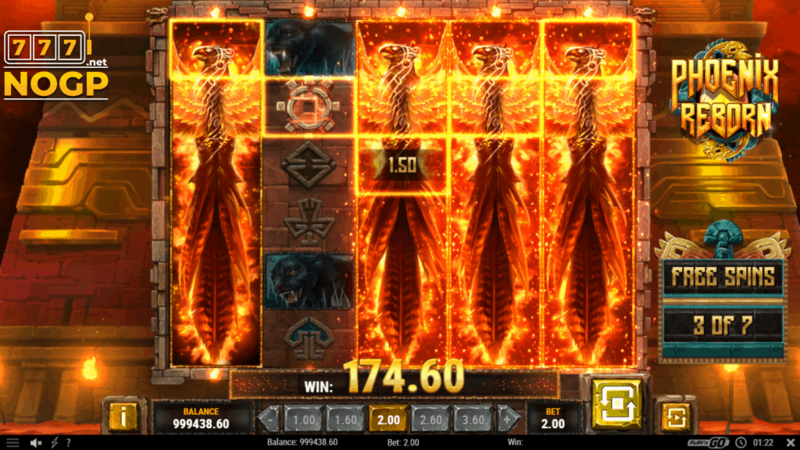 From April 16, 2019, the Phoenix Reborn slot can be played at almost every Play’n GO Casino. If you don’t feel like reading our slot review, you can scroll directly to view our top accredited Play’n GO Casinos. How does the Phoenix Reborn slot work? The Phoenix Reborn slot machine is played on an unusual playing field. The playing field is five reels wide, six rows high and has 40 paylines. This Play’n GO slot has a Phoenix Wild that will expand over the entire reel on which the Wild symbol landed. There is also a free spins feature where up to 40 free spins can be won, but we will tell you more about this later. The game is also responsive and can therefore be played on any device from £/$/€ 0.20 to a maximum of £/$/€ 100 per spin with a payout percentage of 96.50%. Phoenix Reborn Free spins feature. 3 Scatter symbols gives you 7 free spins. 4 Scatter symbols gives you 12 free spins. 5 Scatter symbols gives you 20 free spins. During the free spins feature it is possible to win extra free spins. The Scatter symbols give the same amount as above. The only difference is that 3 extra free spins are awarded from two Scatter symbols. During every free spins, one random reel will serve as a “Wild reel”. This means that the entire reel will be filled with a Phoenix Wild. When the entire playing field is filled with Phoenix Wild symbols you get 1000 times your bet. Symbols and symbol value of the Phoenix Reborn slot. 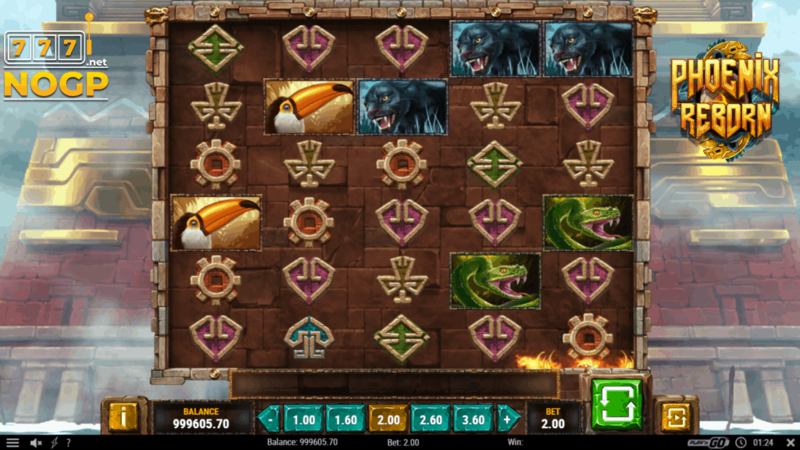 In addition to the Scatter and Wild symbol, this slot also has nine regular symbols, five of which are low value symbols consisting of different Aztec symbols in different shapes and colors. The other symbols consist of a female and male Aztec, a toucan, snake and panthers. You can view the values of the symbols in the table below. The values in the table can be multiplied by the total bet. Our Phoenix Reborn video slot review. First of all we want to inform you that this Play’n GO slot is of high variance and is played on a relatively large playing field. We therefore recommend that you play carefully on this Play’n GO slot. A maximum of 1000 times the bet can be won per spin and the total win is limited to 5000 times the bet. Visually this slot machine looks beautiful. Two features we normally find a bit unclear, but that is more than enough with the Phoenix Reborn slot. When we look at the total picture of this Play’n GO video slot, it gets 3.4 out of 5 stars. Playing the Phoenix Reborn slot machine. If you want to gamble on the Phoenix Reborn slot, we recommend that you do this at one of our accredited Play’n GO Casinos. The online casinos have been assessed by independent experts on various aspects such as safety, reliability and honesty. The Phoenix Reborn slot from Play’n GO can be played at Guts Casino, Rizk Casino, Casumo Casino and Mr Play, among others. If you prefer to gamble somewhere else, check out our top accredited online casinos with Play’n GO software below.